Join Reading Queer Executive Director Neil de la Flor and Reading Queer Program Director José A. Villar-Portela for Pechua Kucha Night: Signifiers in Queer/Feminist Contemporary Art in Asia and Miami. The format is simple: 20 slides x 20 seconds each. 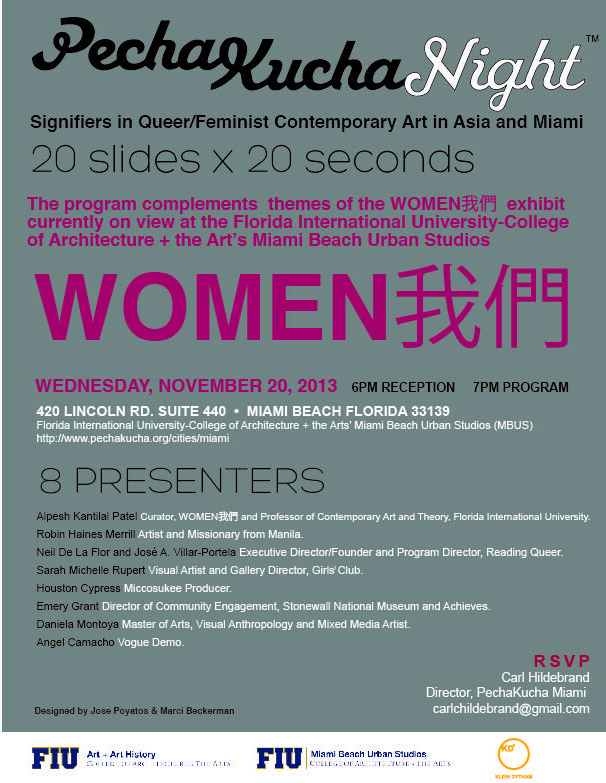 The program complements themes of the WOMEN exhibit currently on view at the Florida International Unviversity-College of Architecture + the Art’s Miami Beach Urban Studios. Wednesday, November 20th, 2013 6:00 PM reception & 7:00 PM program. 420 Lincoln Road, Suite 440, Miami Beach, FL 33139.